My circa 1940 Voigtländer Bessa, a medium-format folding camera, sits on prominent display in my office. It’s been in that spot the entire six years or so I’ve owned it, making it one of my earliest old-camera purchases. It came to me with a hazy lens that I have been meaning to try to clean up. This is partially why I display it in my office – I thought that seeing it every day would remind me to do the job. Clearly, I need to find better ways to remind myself to do things. I finally took the lens assembly apart not long ago and gently cleaned the glass as best I could. My efforts improved, but did not entirely correct, the problem. I’ve seen challenged lenses return unblemished results, so I loaded my last roll of size 120 Fujifilm Neopan 100 Acros and fired off all eight frames one evening. 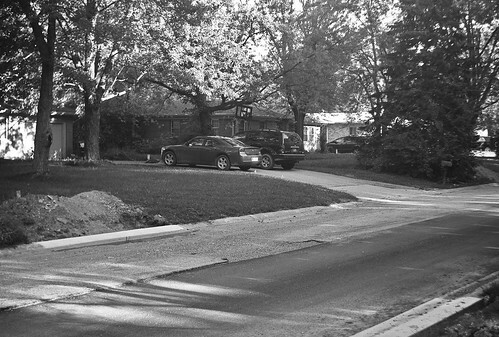 As this was just a test roll, I stayed close to home. This tree is in my front yard. I used the pop-up viewfinder on the top plate for all these shots, and learned that the closer I was to my subject the worse the parallax error. 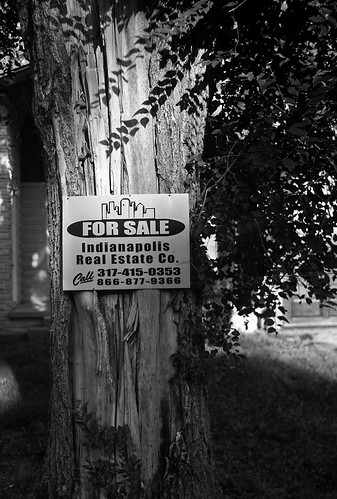 When I framed this, the bottom of the tree trunk was at the bottom edge of the viewfinder. But I was happy that the slight haze that remained on the lens seemed not to matter. These images are plenty crisp and full of detail. I made one long shot, of my neighbors’ homes and cars. (The mound of dirt and the mixed pavement are from the massive sewer project going on in my neighborhood.) I wish I had sprung for plus-sized scans, because I’d like to blow this image up and see if at full resolution I can read the nameplate on the car’s trunk lid. 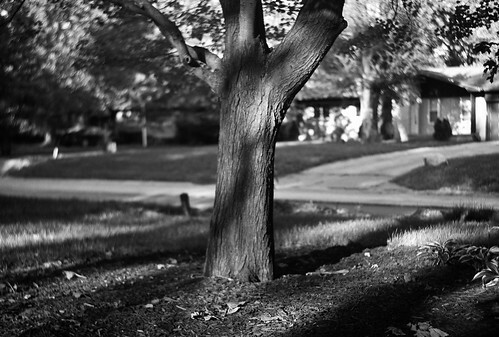 My Bessa is the entry-level model of its time with a Gauthier shutter and a 110 mm f/4.5 Voigtar lens. While the better lens/shutter combinations available on this camera are more desirable to collectors, as you can see this low-spec combination returned fine results. I’ve read that this lens is best at f/11, f/16, and f/22, but in the fading evening light I shot f/5.6 or f/8 at 1/100 sec and am not disappointed in the sharpness and contrast in these photos. I had fun; I’ll shoot this camera again. Knowing me, it’ll be another six years before I get around to it! I had far less fun with a folding Kodak Tourist. It was just a dreadful camera. Check out the photos. I enjoy old Kodaks and Arguses, and I had a great time with a vintage Minolta not long ago. 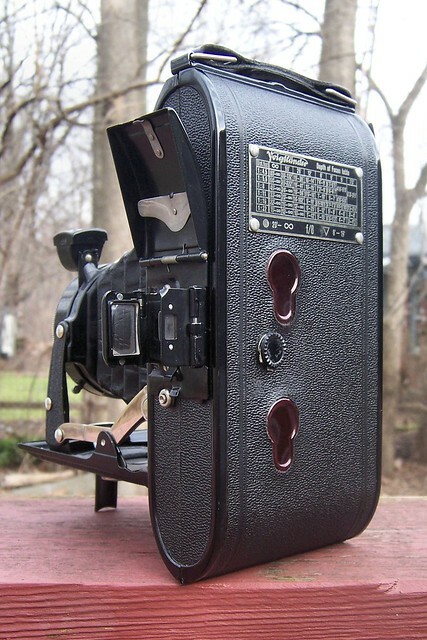 But nosing around eBay and vintage camera forums has given me an appetite for more refined equipment. Consensus is that the Germans made the finest lenses and wrapped them in well-designed, nearly indestructible bodies. Collectors fawn over their Zeiss-Ikons, Rolleis, and Leicas. 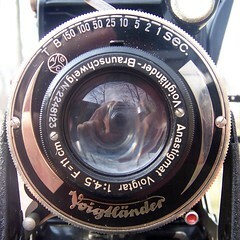 But the granddaddy of all German cameras and the oldest name in photography is Voigtländer, which made its first optical instruments in 1756. Out of respect for its long history, and because I think umlauts are cool, I decided to start with Voigtländer. When I saw the very large price tags good original or even restored Voigtländers go for, I said gack. I have other ways I need to spend hundreds of dollars right now. 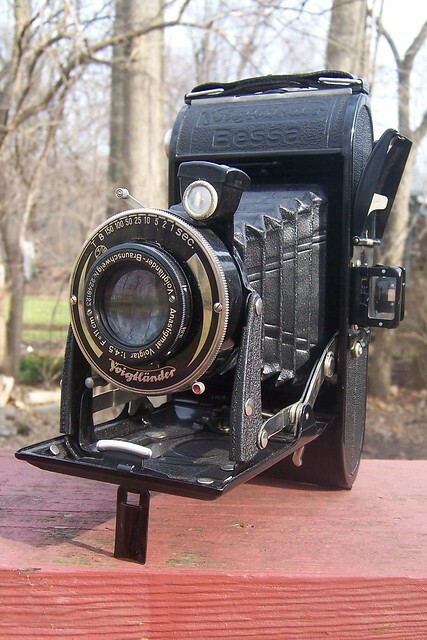 Then I noticed that a particular medium-format folding Voigtländer, the Bessa, routinely sold for well under $100. When new in 1929, it was marketed to the serious amateur who wanted the Voigtländer name and fabled build quality but at a price that was not entirely out of reach. I kept watching and bidding and finally snagged one for about $30. Based on the lens’s serial number, my Bessa was made between 1937 and 1942. 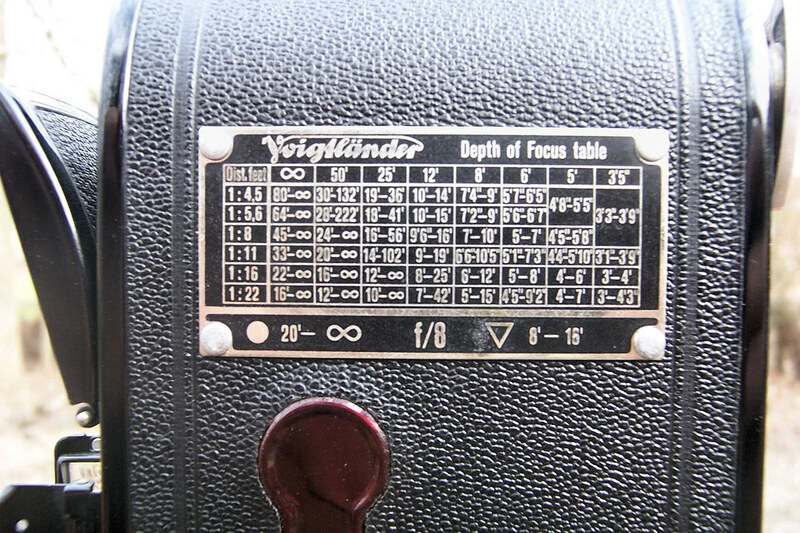 Voigtländer made over a million cameras using the Bessa name through 1957, but the original Bessa was made through 1949 with several years off during World War II. Voigtländer added features to the Bessa several times during the run, so earlier examples lack the folding viewfinder, the door-mounted shutter release that retracts when you close the door, the bellows and lens that extend on your own when you open the door, and the ability to take 6×9-cm or 4.5×6-cm photos that come with my camera. Voigtländer made the camera with a range of lenses, starting with the entry-level Voigtar and moving up in sharpness from Vaskar to Skopar to Color Skopar, all uncoated, I think. They also made the camera with a range of shutters, from the simple Prontor to the higher-quality Compur and Compur Rapid. Bessas with the better lenses and shutters edge back into gack territory. My camera comes with the Voigtar lens (at f/4.5) and the Prontor shutter, which kept the price down both now and when new. Another reason the original Bessa can be had for reasonable cost is that it has no rangefinder, leaving focusing to guesswork. How far away is the subject, anyway? Six feet? Eight? Guess wrong, and the shot is wasted. A rangefinder finds the distance for you, eliminating out-of-focus shots, and even collectors appreciate that. In general, a great way to score quality vintage glass on the cheap is to look for cameras that lack a rangefinder. Even though the Bessa was a fairly pedestrian camera by Voigtländer’s standards, it is still full of excellent design. 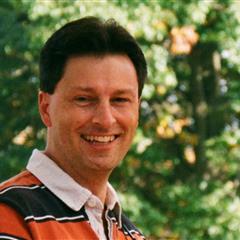 For example, it has a clever film delivery system that simplifies loading. A little panel over the film spool holds the film in; swing it out, drop a roll of 120 film in, and swing it back, no spindles necessary. It also comes with a mask that lets it take 4.5×6 photos. Just insert the mask into the slots, as the photo below shows. The pop-up viewfinder even has a separate pop-up mask so you can frame 4.5×6 shots. Also check out the back and its two exposure-counter windows. That little knob between them opens the windows so you can see which exposure you’re on. If the 4.5×6 mask is not inserted, twisting the knob opens only the bottom counter window. If the mask is inserted, twisting the knob opens both windows; the top window counts the smaller exposures. At least it’s supposed to work that way; it’s broken on my Bessa. And the knob itself is prone to falling out. The Bessa also tries to make focusing less error-prone. The focusing ring shows distance in feet, but it also includes an upside-down triangle and a circle. At f/8, focus to the upside-down triangle and everything between eight and 16 feet will be sharp. Focus to the circle and everything 20 feet and beyond will be sharp. If you’re a good guesser of distance, use the depth-of-focus chart on the back to get results with greater depth of field. Unfortunately, my Bessa has issues. The shutter sticks below 1/25 second. The waist-level viewfinder is pitted. The folding viewfinder is supposed to pop up automatically when you extend the bellows, but it sticks and you have to pry it open. These problems can probably be solved with a good cleaning and lubing. But most disappointingly, the lens is cloudy. It may just need cleaning, or it may be permanently damaged. Despite my Bessa’s problems, this sturdy camera is crammed with well-designed coolness. It is the stuff. If Homer Simpson collected cameras, he’d pick this one up and say Voigtländer, ohhhhh. Except Homer couldn’t pronounce the a-umlaut, I’m sure. Update: I finally did put a roll of film through this camera. See some of the photos here.